This page is used to note all the new additions to the site, for repeat visitors. Main homepage is Don DeLillo's America. Posted a couple new images with publication details on the Swedish editions page. A new interview with DeLillo with comments on Love-Lies-Bleeding and the current affairs, on the Interviews page. Rachel Kushner says DeLillo helped name her recent The Mars Room; a nice new Odds & Ends entry. Added two recent DeLillo appearances to the Event page. Added a rap-related Odds and Ends item, and added an upcoming Event in London (thanks due to Sekhar and Richard). Spent some hours cleaning up broken links across the site. The web is kinda broken that way - people keep reorganizing their sites or just deleting things. Kudos as always to Internet Archive! Created a page for the Ukrainian Editions upon the publication of Zero K.
New DeLillo story "The Itch" in the New Yorker (online & Aug 7-14, 2017 issue) and added to the stories page. Added entry for the upcoming DeLillo conference (April 28-29) in NYC to the Events page. A belated report on new White Noise film project on the Odds and Ends page. A couple updates to the events page. Updated info for the DeLillo appearances in Italy next week. Dates and links for events in the October 22-26 span in Rome, Turin and Genova. (Thanks to Nicola!). Also a short new entry on the Odds and Ends page. DeLillo will be on the move in coming weeks, with new events listed for Rome and Austin, Texas. Also, the film based on The Body Artist (previously mentioned on the Odds and Ends page) is now being shown - new page for "Never Ever". And check out this new page for the Swedish editions - great cover designs! Added a DeLillo appearance next week in Cleveland, OH, listed on the events page, plus a new Odds and Ends entry. Added a DeLillo appearance planned for 2017, listed on the events page. Also listed a fun UK interview on "What I've Learned". A quick note that The Spinoff out of New Zealand has been running a DeLillo Week right now with reviews and discussions of the man's work. Today the site features a review of Zero K by Thom Shackleford. Check it out! Added a DeLillo appearance that I missed - Toronto on June 2 - now listed as an event along with a link to a short article with some quotes from his visit. Also listed a reading in Madrid that I believe took place on June 10. Another DeLillo event in London in June at Southbank Centre. Also several new entries on the Zero K Media Watch page. Several UK entries on the Zero K Media Watch page, including a good interview in The Guardian. Almost missed the DeLillo event in San Francisco tonight with Rachel Kushner. Also put in a new Odds and Ends entry for the Ben Rhodes story. A couple more entries on the Zero K Media Watch page. 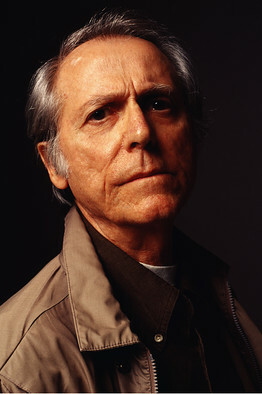 Also - DeLillo here in Portland on Nov. 17 at an event with Noah Hawley (I believe the first contributor to this site!). Zero K now available in the U.S. A couple more entries on the Zero K Media Watch page. Yet more new entries on the Zero K Media Watch page including a brief NPR interview. And more new entries on the Zero K Media Watch page. Also - DeLillo in LA on May 11 at a Writers Bloc event. Many new entries on the Zero K Media Watch page. Also - DeLillo in NYC on May 2 at a 92nd St Y event. Michiko Kakutani/NYT weighs in on the Zero K Media Watch page. Several new entries on the Zero K Media Watch page, with a couple reports from Down Under. A number of new entries on the Zero K Media Watch page, including the Spanish edition cover. Also - DeLillo in London in a June event, news of a French film adaptation of The Body Artist in Odds and Ends entry, and a cool new DeLillo 'Writers Block' portrait on the Bio page, created by Steph Ketnick here in Portland. Harper's has published an excerpt story from Zero K entitled "Plexiglass" - find the link on the Zero K Media Watch page. Updates to the Events page, with listing for an Athens appearance on March 16, and a report from the Paris conference. Also added a new brief Interview in conjunction with the visit to Greece. The New Yorker has published an excerpt story from Zero K entitled "Sine Cosine Tangent" along with a brief interview - find the links on the Zero K Media Watch page. Hey! Today marks 20 years of existence for the Don DeLillo's America site! No special events planned, but perhaps the link just added to the Zero K Media Watch page, a piece from Tom LeClair entitled "Death and Life with Don DeLillo" is existentially fitting. Created a Zero K Media Watch page, starting with an early mini-review from Publishers Weekly. Updates to the Events page, with a transcription of DeLillo's comments upon receiving his latest award last night, plus a brief encounter in Portugal. Scribner has posted a cover image for DeLillo's next novel Zero K.
Put in two working links for DeLillo stories - fixed the "Total Loss Weekend" link and put in a new one for "Human Moments in World War III" on both Stories and Bibliography. Also put in an Odds and Ends item for Garth Risk Hallberg. DeLillo listed as a guest for the Lisbon & Estoril Film Festival in early November, added to the Events page. Added a report for DeLillo's appearance in in NYC on Oct. 2, as part of The New Yorker Festival, to the Events page. It's getting hard to keep up with DeLillo news lately! Today came the announcement that he has been awarded another significant prize, the 2015 Medal for Distinguished Contribution to American Letters from the National Book Foundation. The Award ceremony event will be on Nov. 18. Also AP ran a story with a few responses with DeLillo which I added to the interview page. DeLillo's next novel Zero K has a page and now has a short dust jacket type description from Scribner, but no cover image so far. Thanks to alert friends of the page for the pointers! Also added an Event for a DeLillo conference in Paris, February 2016. The big news today - DeLillo's next novel is titled Zero K and is scheduled for publication in May 2016 (per both Amazon and Scriber web listings) - no cover image yet, however. Also there's been a flurry of activity related to Underworld - new UK edition and media entries, including a new short DeLillo afterword, and an introduction by Rachel Kushner. Also added an event for the recent passing of E.L. Doctorow, to the Events page. Added an upcoming event in NYC on Dec. 2, DeLillo with Joy Williams, to the Events page. Added a blurb listing for the 1984 Bantam edition of Stephen Wright's Meditations in Green to the Bibliography, and added an entry on a Pitchfork piece in which several musicians comment on White Noise to the Odds and Ends page. Added exactly one sentence to the blurb listing for Gordon Lish's Peru to the Bibliography, and added an upcoming event in Brooklyn on April 27 to the Events page.